Students in Miami Law's Professional Responsibility and Ethics Program headed north recently to sit with members of Miami Law's Alumni Associations and dissect questions surrounding the ethical use of social media and other technologically evolving tools. In West Palm Beach, a presentation by students Amanda LeCheminant, Jessica Bouis, James Lechter and Shayla Walden focused on legal ethics issues arising in the area of attorney's blogs, discovery of Facebook evidence and Florida's new advertising rules. Bouis said later that the presentation's "hot topics" encouraged a productive debate among the attorneys. For the students, the ethics presentation at the West Palm Beach Alumni Association was not only an educational experience but a time for networking with other legal professionals. After the session, the students had a chance to mingle with the various attorneys and judges at a reception held by the association. LeCheminant said she appreciated her final PREP experience before her graduation next month. "Each of my PREP presentations has turned out to be more educational and interesting than I could have expected," she said. Devang Desai, the President of the Law Alumni Association, sent an email expressing his thanks to the PREP team. 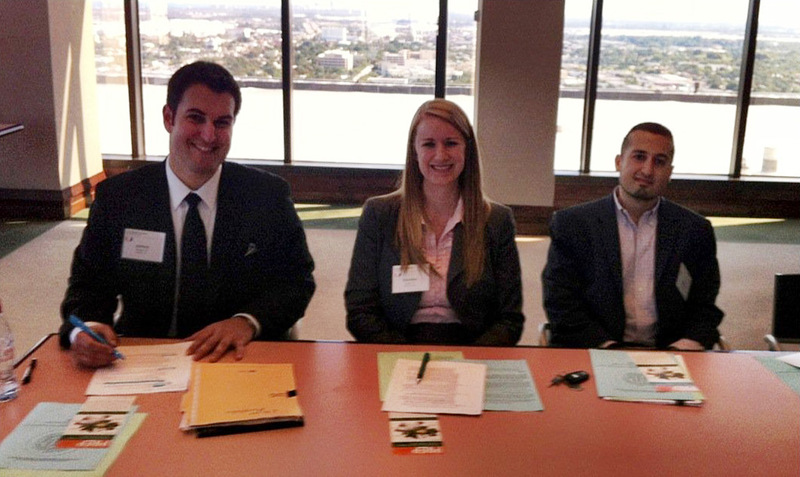 "The information shared and the commentary provided by the PREP law students was invaluable and insightful," he wrote. "You have certainly created a wonderful model to engage our current law students in emerging legal issues and provided a useful vehicle to educate members of our Bar." A few days later, PREP students Kamal Sleiman, Joshua Plager and Danielle Singer presented a CLE training session for the Broward County Miami Law Alumni Association. The students engaged the attorneys and judges present in a discussion about cloud computing, meta tags, investigating jurors via their social media pages, judges on Facebook, and the impact of the new Florida advertising regulations on law firm websites and social media pages. Many of the attorneys and judges offered their own opinions and posed questions about scenarios that have arisen in their own or their colleagues' practices. "I enjoyed talking to attorneys and judges afterwards about how our presentation caused them to think deeply about the new issues that they must confront as technology rapidly advances," Singer said. For his part, Sleiman said it was "great to connect with judges, practitioners and alumni in an educational yet colloquial setting." Plager too weighed in. "I appreciated getting practical and candid input about social media from experienced attorneys," he said. "Reading and presenting about the ethics rules is an entirely different exercise than seeing them in actual practice." The Professional Responsibility and Ethics Program was established in 1996 as a way for students at Miami Law to create and present CLE training for legal professionals. Students in the program have dedicated countless hours to public service and have educated thousands of members of the Florida Bench and Bar. Through the program, students are often able to make a positive impact on attendees by prompting them to reconsider their approaches to some of the toughest ethical dilemmas. The ABA recognized PREP in 2012 with its E. Smythe Gambrell Professionalism Award, which recognizes programs and projects that contribute to the understanding and advancement of professionalism among lawyers.